Secretary of State candidate Deidre DeJear narrowly defeated Jim Mowrer in the Democratic primary today, propelling her to a matchup with incumbent Republican Paul Pate. 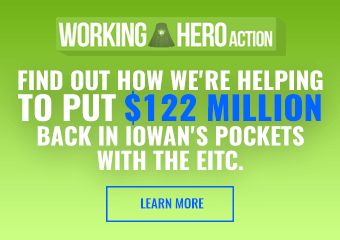 Were DeJear to win in November, she would become Iowa’s first black statewide elected official. 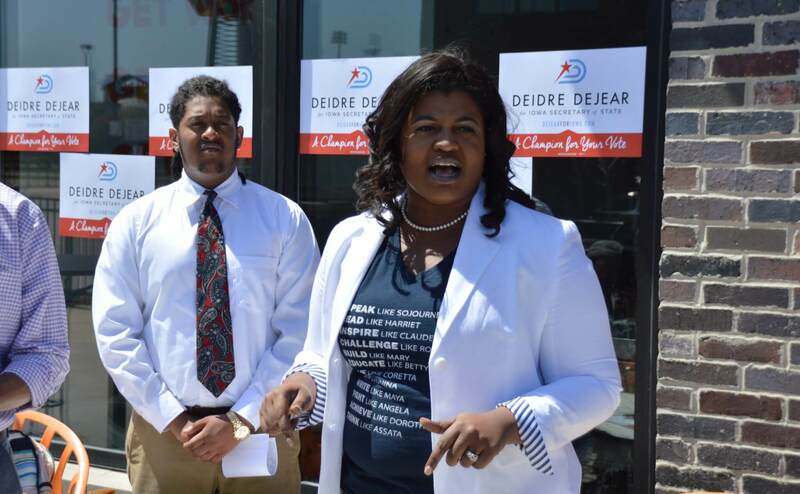 DeJear’s candidacy for the top elections official post will be a deeply personal effort for the 32-year-old business owner. Born in Mississippi, her father didn’t have the chance to vote for much of his life in the Deep South state. She grew up in Mississippi and Oklahoma, then came to Iowa for school at Drake University. DeJear worked on Barack Obama’s campaign in 2012, heading up African American vote outreach efforts. 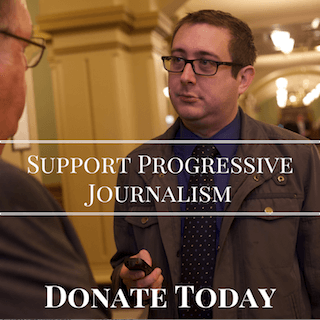 Although largely an unknown to most of the Iowa Democratic political community before last year, DeJear put together a solid campaign and impressed donors and activists. She even raised more money in the last finance report than Mowrer, who had run for Congress twice before. EMILY’s List also got involved in the race, endorsing DeJear in a statewide race that doesn’t typically see much outside help. However, there will likely be substantial assistance for DeJear for the general election. Jason Kander’s Let America Vote organization and others have turned national Democrats’ focus to secretary of state races that impact voting laws. Kander’s group has a very large presence in Iowa. DeJear’s spot on the Democratic ticket will also be a welcome addition to a party that values diversity. Had she not won tonight, the entire statewide ticket would be white men (though an eventual lt. governor pick almost certainly will be a woman and there’s female congressional candidates). She’s also proven herself to be an enthusiastic, rallying speaker on the campaign trail, so watch for her to be one of the party’s best ways of motivating their base to turn out. NEXT POST Next post: Why Is Reynolds Defending Trump’s Trade War? I heard her speak at our Central Committee meeting several months ago, and all I can say is wow! She is a fireball, a compelling speaker, has great ideas, and is sorely needed in state government. Nothing against Jim Mowrer, but Ms Dejear is the real deal! Deidre DeJar personally called me to vote in the primary. 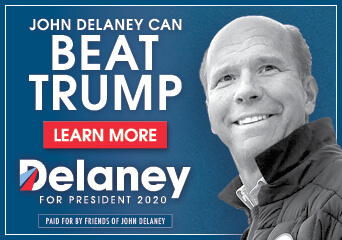 No other candidate did. I was impressed with her oratory skills, and voted for her. I will vote for her in November for what she stands for–no other reason as color, gender, etc. is irrelevant to me. Can we be done with Jim Mowrer now? 3 losses in a row. Just like Monica Vernon. Time for new blood, I like it! DeJear is the real deal! She has traveled throughout the state and she’s listened to Iowans. She knows the issues that matter to us and she’s built her platform around those issues. She supports small businesses and she’s against the voter ID law. She knows the importance of having a voice at the polls. Deidre is brilliant. She’s a bright and rising star. I support Deidre DeJear 100%. Bravo! It’s long overdue for both parties here in Iowa to do a better job of fielding a diverse lineup of candidates. In 2014, I heard Deidra speak at the Democrat’s State Central Committee when she was running for the 3rd Vice-Chair of the state party. She was impressive then. This spring, she spoke to the Southeast Dallas County Democrats where she spoke about the job of Secretary of State with the emphasis on small businesses and access to the polls. Her experiences will lend a new perspective to the job. Deidre is a strong candidate and uniquely qualified for this role: she knows how to reach fringe voters and get out the vote, but her significant experience working with many small and start-up businesses has also trained her for this critical aspect of the job. Not a bit surprised she came out ahead of Mowrer — let’s get her across the line ahead of Pate.